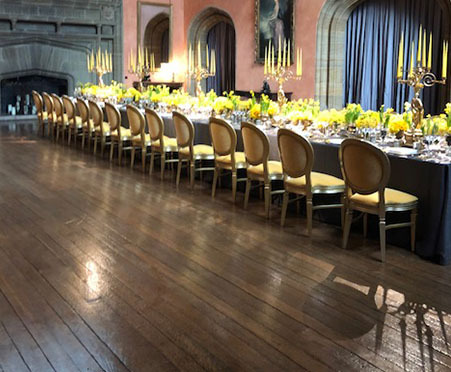 On Thursday 14th March our venue specialist Katherine West had an exciting opportunity to experience Cowdray Estate in all its glory. Venture with us, into the sprawling and picturesque countryside of the South Downs and get acquainted with Cowdray House, which takes pride of place on the estate, and learn why it may be the venue on the top of your list for your next meeting or event. The day started at 3pm and I was welcomed by the Cowdray team and given a pair of Le Chameau wellies to start the afternoon activity which was duck herding. Duck herding was something I had never experienced first-hand, and I was really excited to see what it entailed. There were also around 20 other venue experts and agents, who seemed as intrigued as I was, so we grouped together in anticipation to find out what it was all about. The whole activity was fantastic fun and a perfect team building exercise to break the ice and get to know everyone better. It was interesting too as, amongst the physical challenge of herding ducks around a series of obstacles with highly trained sheepdogs, we were also were given some insightful facts, background knowledge and information on the traditional skill of sheepdog handling. Never did I think that the combination of ducks, geese and sheepdogs in the middle of a field in March, would equate to so much fun, but it is definitely an outdoor pursuit that I would recommend for clients if they are looking to enhance teamwork, communication skills and morale within their teams. Estate Fact: In case you were wondering about the specific mention of the wellies, Cowdray Estate has been partnered with the leading luxury boot brand Le Chameau since last year, which means guests are treated to wearing their fabulous footwear. After bonding over the fun-filled activity, we had the opportunity to have a tour of the magnificent Cowdray house, which is offered as an exclusive-use, luxury venue. On first impressions, the house is certainly visually impressive from the outside and is perfectly situated in and amongst 100 acres of beautiful gardens and rural grounds, forming part of the larger 16,500 acre Cowdray Estate, which is located in the lush and tranquil South Downs National Park. Walking through the doors of Cowdray House, provides the WOW factor in abundance. 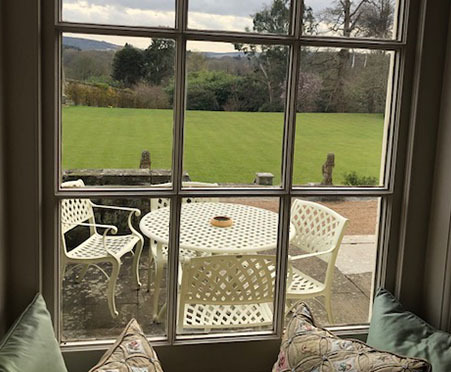 Having stood in the grounds, since 1875, the most recent occupiers of the house, 4th Viscount and Viscountess Cowdray have restored and refurbished the property wonderfully and the décor and furnishing used throughout adds to the opulence of the venue and transports you back into another time. 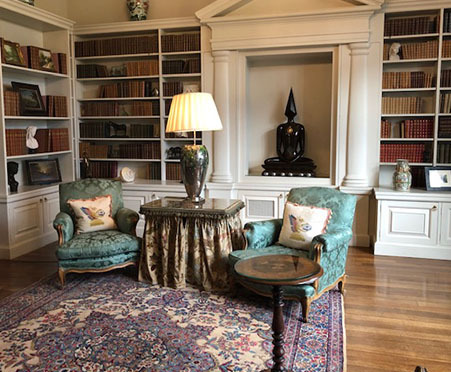 Although the house is beautifully traditional and in keeping with its stately surroundings, it has lots of formal and informal spaces with all the modern facilities, including AV equipment, required to make it a venue suitable for corporate meetings, as well as incentives and other events that are looking for a private, but exceptional experience for their delegates. On our tour we were shown the multiple reception rooms which offered various spaces and set ups, providing a great range of options for meetings with differing specifications. Around every corner there was something new to see and another fantastic aspect of this venue to discover. Housed within the building and its grounds is an indoor heated swimming pool, which has an outdoor counterpart for warmer days; a sophisticated Billiards room; tennis courts; croquet lawn and as if that wasn’t impressive enough, there is also a bowling alley – strike! Oh, and in case you get bored (unlikely), there’s an impressive collection of board games to work your way through. The best thing about an exclusive-use venue is that this was all solely for our group to enjoy. The house also has 22 double rooms and 2 single rooms, with further rooms available in cottages on the estate, so it is by no means a venue that would struggle to accommodate small to medium size groups of delegates. Every room was unique and had its own gorgeous character to offer; the views from the rooms we visited, were just spectacular too, and if there weren’t so many other activities to enjoy, you could quite happily spend your time relaxing in the comfort of the boudoirs here for your entire stay. As part of the tour we were shown the various areas where food could be served in the house, including Buck Hall, which was amazing and has the scope to be used for both day and evening use. It was great to hear that the menus created are all seasonal and include local produce and meat from the estate. I was completely bowled over by how elegant and stunning the entire property was and how flexible the various reception rooms were in terms of offering functional meeting and event spaces. Even as a remote location, it is still easily accessible from London and its airports, and there are train stations in close proximity for those who wish to travel by rail. After the tour we were welcomed into the grand library for an afternoon tea, this was all prepared and served by Rhubarb caterers, who are renowned for their reputation of stunning dishes and high standards - this was portrayed in their food throughout our time at Cowdray. The afternoon tea was a great way to continue key conversations with other agents and the team at Cowdray, where we learnt more about the estate and the amazing history it has to offer. After some free time where we could relax and get ready for the evening ahead and make the most of our lavish bedrooms, we met for pre-dinner drinks. 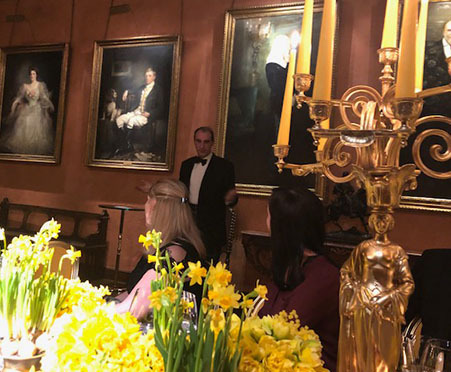 We then went through to Buck Hall, where the table was laid in a truly mesmerizing way, filled with daffodils filling the room with spring. 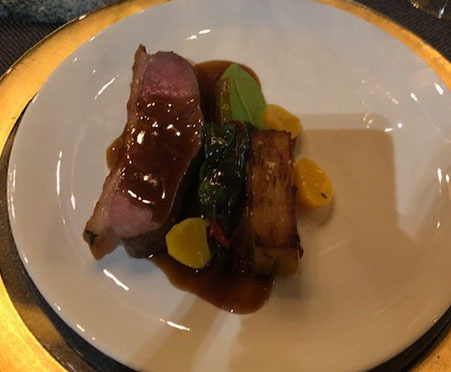 Rhubarb catering again did not disappoint, and we were blown away by the magnificent food and presentation which was placed before us. The evening entertainment was through to the drawing room where a three-piece band played all sorts of songs which got us all up and dancing. My time at Cowdray Estate was truly memorable and will be a venue that I will definitely be recommending to clients. With so much to offer, Cowdray is a venue that is more than just a stately house. The property has really thought about its proposition and would suit the needs of businesses looking for an astounding space for their meetings, a distinctive incentive destination based close to London, or for any other event that needed to inspire and leave attendees feeling that they had been given a prestigious experience.